Mary has lived and painted throughout the United States, and is now based in Tennessee. She is well known for her commissioned portraits in oil. Depending on her client's wishes, Mary paints in a controlled formal manner or in a loosely posed impressionistic style. Often the more impressionistically painted portraits are of casually grouped families at the beach. Her objective is to convey the spirit and personality of her subjects, while maintaining accurate and convincing likenesses. Utilizing a strong design framework, beautiful harmonic color, and masterful paint application, Mary connects with the viewer by creating powerfully expressive paintings that become family treasures. "A well rounded painter needs to be proficient in portraiture, landscape and still life" says Mary. To keep her approach and technique fresh, she enjoys switching between painting disciplines. Mary spends much of her summers in California and coastal South Carolina, and enjoys painting landscapes "en plein air". She has created a body of work that reflects her love of combined landscape and figure painting. In Mary's new series of birds and their habitats, she is using abstract painting techniques to convey kinetic energy and motion. Her Koi paintings describe the mysterious and contemplative world that is found underwater. Mary is also working on a Barn Series, which capture glimpses of our vanishing rural history. From her studio, Mary's floral paintings and still life works reflect the delicacy of nature and the beauty that can be found in simple everyday objects. A recent exploration into non-objective painting has taken Mary back to her abstract roots. These paintings, distilled to the essence of color and shape allow the viewer to create their own narrative. Mary is a member of the Oil Painters of America, the National Portrait Society, American Impressionist Society, American Woman Painters, Woman Painters of the Southeast, TACA, the Stones River Craft Association, Nashville Artist Guild and the Contemporary Collective, Nashville. Her work is in the permanent collection of BlackBerry Farm in Walland, TN, Vanderbilt's Monroe Carell Children's Hospital, TN, St Thomas Hospital, Murfreesboro, TN, Murfreesboro Medical Clinic, TN, Welch Road Pediatrics, Palo Alto, CA and the Brentwood Academy, Nashville. Her work can be viewed at All About Art Gallery in Hendersonville, TN, Bennett Galleries in Nashville, TN, The District Gallery in Knoxville, TN, Ellis Nicholson Gallery in Charleston, SC, The Peddler in Murfreesboro, TN and Wild Hope Gallery in Alpharetta, GA. Mary is represented by A Stroke of Genius Portrait Brokers. Mary has exhibited in many national and regional group shows. She was juried into the Oil Painters of America Eastern Regional Show 2013, 2016, The Cumberland Society Show 2013, the American Impressionist Society Show 2012, Woman Painters of the Southeast 2012, TACA, Penrod and numerous Central South Art Exhibitions sponsored by the Tennessee Art League. Mary's painting, "I've Got Your Back" won best of show at the 2012 Belle Meade Mansion Juried Art Show. 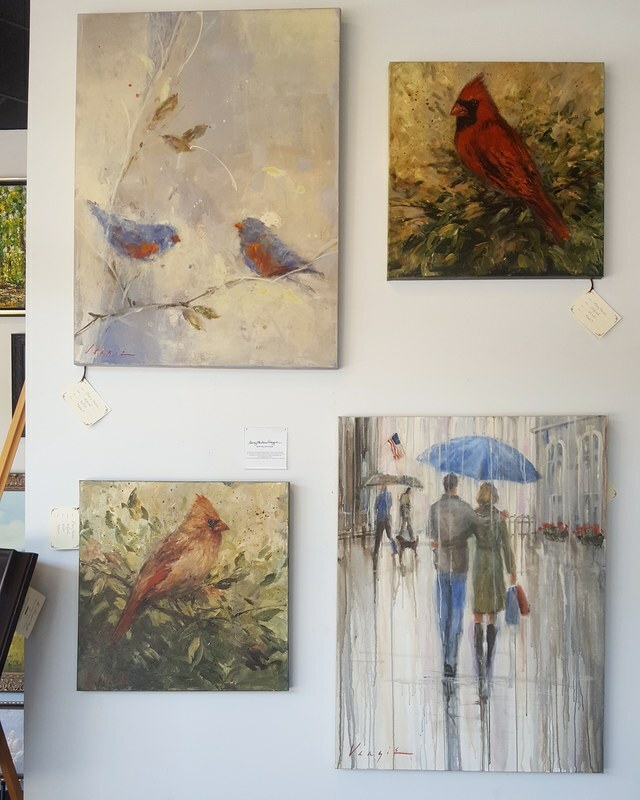 She has been published in American Art Collector, Nashville Arts, The Nashville Tennessean, Murfreesboro TN News Journal and Gentry Magazine, Palo Alto. CA. In addition to painting and raising a family, Mary teaches workshops with an emphasis on design, technique, and color. She finds it extremely rewarding to be able to paint and to share her knowledge and love of painting with others. "I am truly blessed to have a profession that gives me great joy" says Mary.